This past long weekend was a busy one! I had 17 items on my "To-Do" list, 7 of which were labour intensive. Not to mention all of the laundry and regular work that had to be done! I am proud to say that Hubby and I crossed every single thing off of our list. My favourite item? We planted our garden! I promised myself to do things a little differently this year. I planned for half of my garden to be perennial flowers and the other half for vegetables. I love flowers! I chose to do perennials to help save myself some work (hopefully!) in the future. 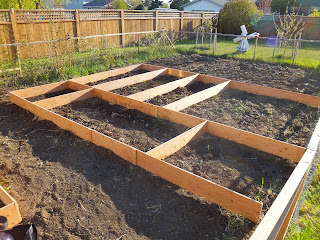 I got Hubby to build borders around each vegetable patch. I hope that it will help me know exactly where my plants are. I thought that it might help to keep the plants separated and make it easier to weed. We will see if that works out! 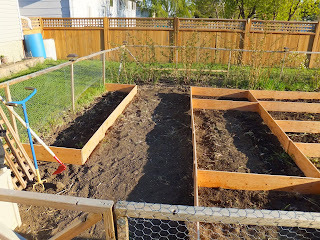 Hubby tilled the garden and then I grabbed my handy-dandy measuring tape and measured out my vegetable patches. I had sketched out a scaled drawing in March. I had already chosen where my veggies would be planted and how much of each plant would be planted. Hubby built borders for my veggie patches, according to the strings marking each patch. I thought that the borders would take a while, but Hubby whipped them up really fast! I was impressed, but he told me they were "easy". Sometimes, he forgets that he is married to a woman whose construction skills are limited to Popsicle sticks and hot glue! 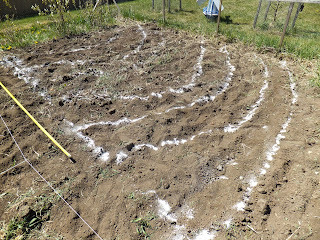 I planned my perennial garden out, using flour to section off each plant's area. I heard that idea on T.V. somewhere. The flour won't mess with the soil pH, making it safe to use. 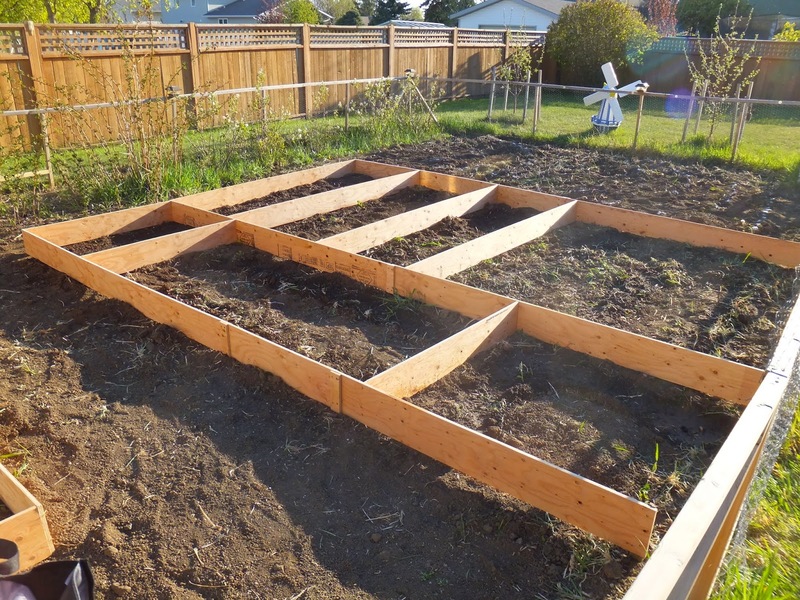 I then planted according to the sections and my pre-determined garden 'blueprint'. It felt like it took FOREVER because those seeds were so tiny! I was pleased with how it turned out. I hope all the plants come! I am going to go crawl into bed, now. I am exhausted after our busy weekend. I hope everyone had a lovely weekend. Take care! Girl, 17 things over the weekend? Ya'll must have not stopped! Great job on the garden! I wish we had room to plant a big garden. My husbands grandparents does a huge one (like 2 full acres) but I'd love to have a smaller one at our house! Yup! We basically worked the weekend away. We didn't get much sleep! Ha ha! Thank you for the compliment! Our garden isn't huge but we get quite a bit of produce out of it. We started with a tiny garden and expanded it from there. I bet you would love a garden. (Maybe once the kitchen reno is done?) Thanks for stopping by!